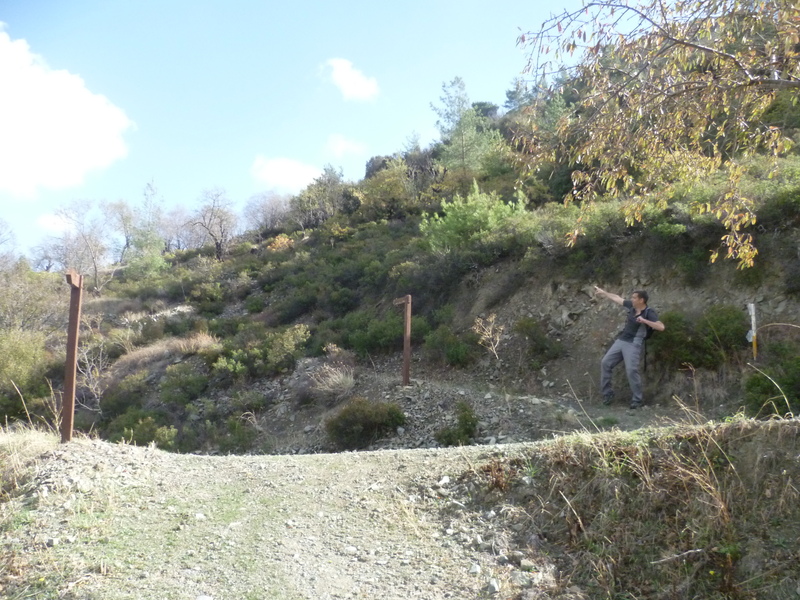 Difficulty: A moderate walk on ridge paths and earth tracks but involving a number of climbs and descents. Plenty of shade throughout. 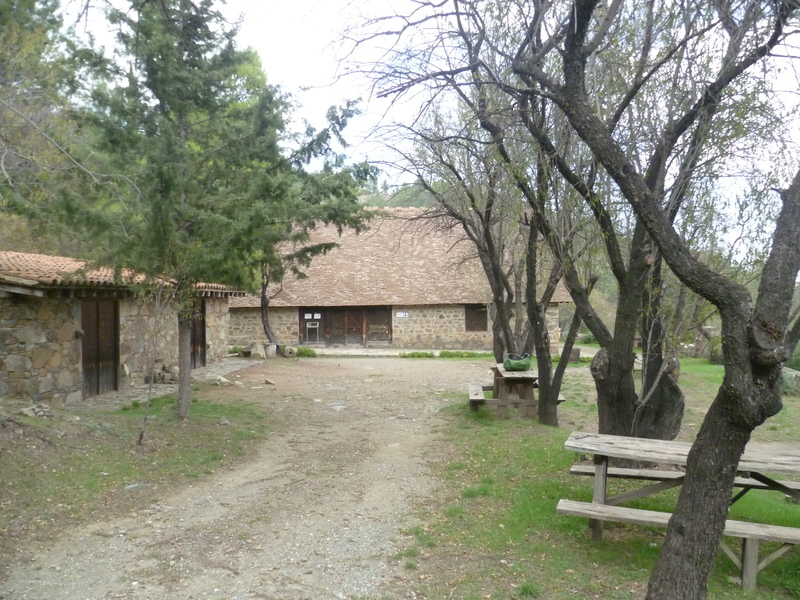 Option 1: There is a clear linear walk between the churches of Panagia tou Araka and Stavros tis Agismati. This is around 7.5km long and takes around 2.5 hours to complete. A return via the same route will therefore take around five hours without stops. It’s such a gorgeous route that it doesn’t really matter about retracing your steps; the views bear a second look. Option 2: Or you can do as we did and make this a circular walk – this will mean that the last 7 km are walked on the E907. We walked it on a Sunday afternoon in October and there was very little traffic. There is a verge alongside the road which you can walk along but it isn’t ideal. Note that the CTO maps show a trail (No 32) between the two churches. On the map this looks significantly different from the E4 route which also joins the two churches. If there were two separate routes it would make a perfect circular walk. Sadly, there aren’t. The two routes are identical. Another reminder that CTO maps need to be viewed with a degree of scepticism…. Start the walk from the Panagia tou Araka church. This is just outside Lagoudera on the F969 to Saranti and is quite well signposted. The church is sometimes open for visitors but there is no obvious indication of dates and times. If it is open it’s worth spending a few minutes admiring the lovely interior before starting the walk. 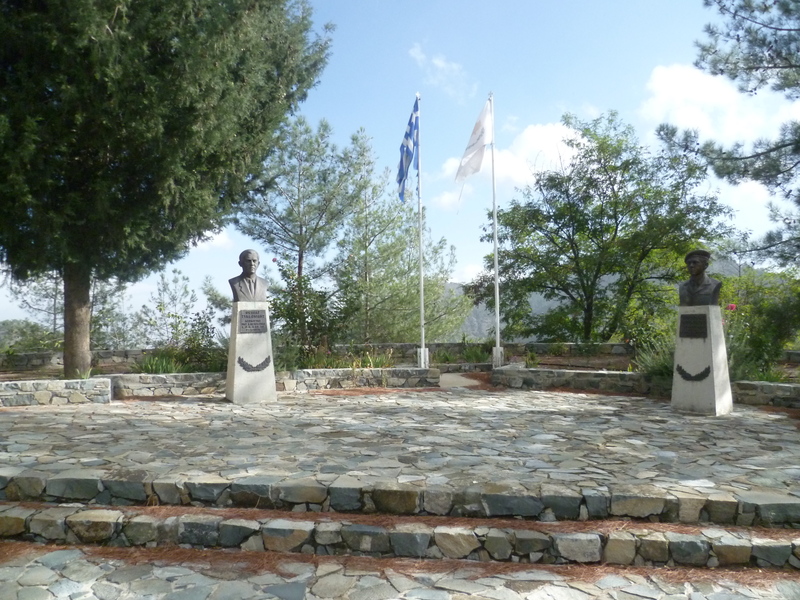 Walk along the road back into the village of Lagoudera, passing a monument (on your left) to two EOKA fighters. 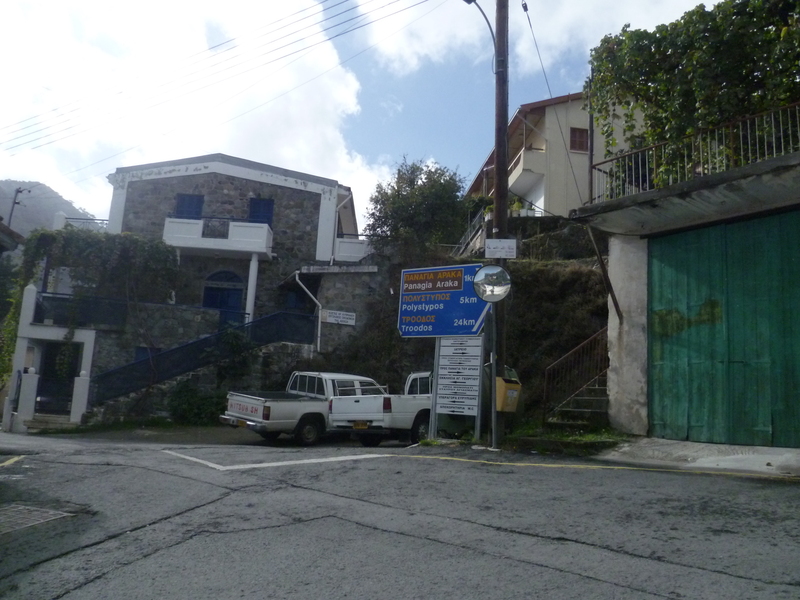 When you reach the first junction (3-4 minutes) turn left and head down to the centre of Lagoudera. 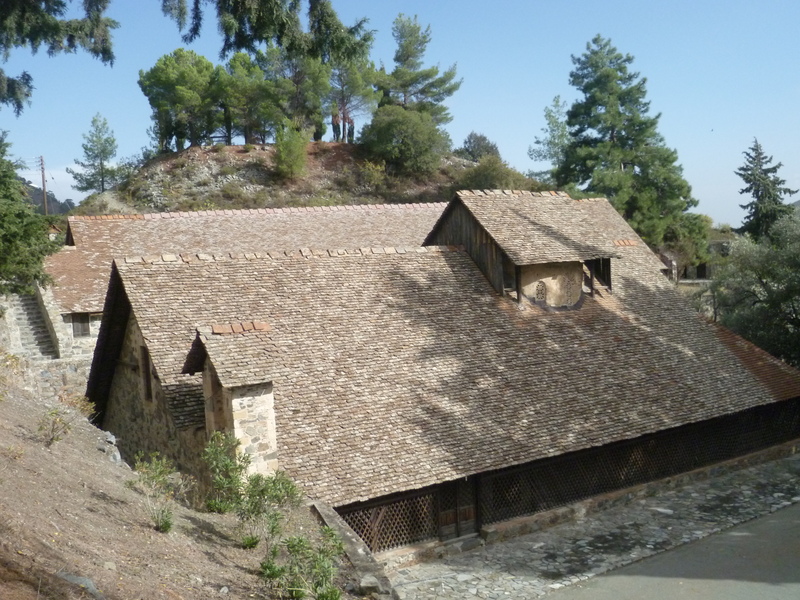 After 10 minutes you will reach a junction in the village centre where a signpost points back towards the church, also to Polystopos 5km and Troodos 24 km. Follow the E4 sign on the telegraph pole below the blue signboard which takes you on a small side road downhill. Watch carefully for the E4 signs on this part of the walk; you will see a marker on a telegraph pole just a little way down this road. About a minute later you will turn left in front of pink house and then almost immediately dog-leg to your right at the end of a metal railing. All of these turns are clearly signed with E4 markers. After 15 minutes you will see a wooden signpost pointing to the nature trail. This takes you off the road and onto a path which heads briefly downhill, then starts to climb along the side of the valley. 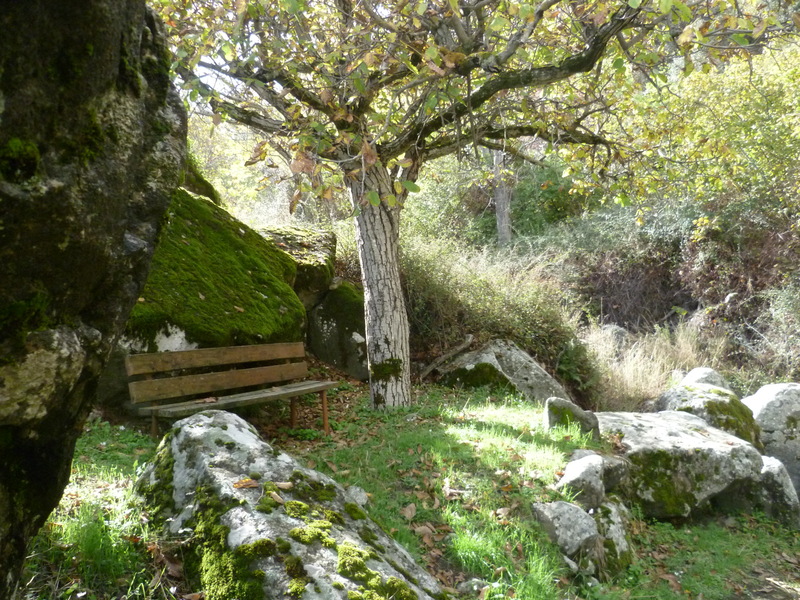 At 17 minutes you will pass a wooden bench in a delightful shady spot. It’s far too soon to be thinking about sitting down! Follow the path upwards as it crosses a track at 24 minutes. 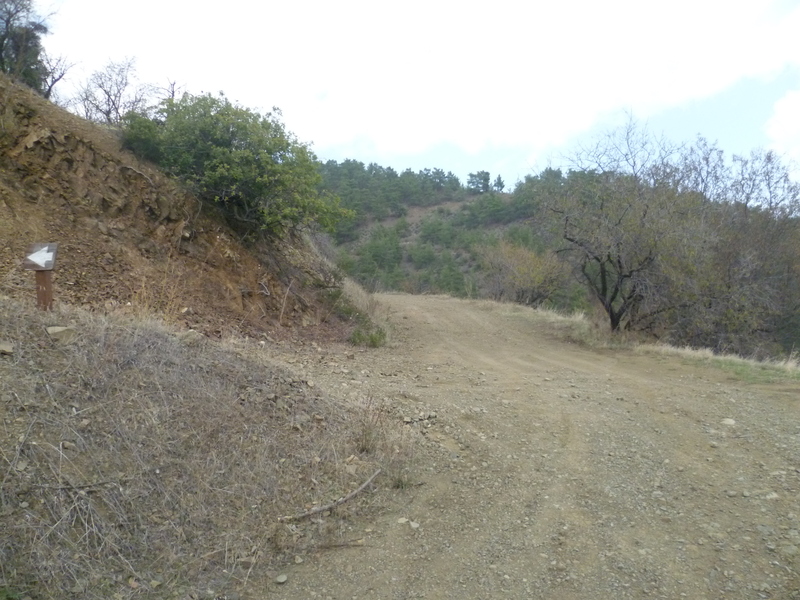 The path continues to climb steadily, leaving behind the terraced vineyards and winding uphill through pine forest interspersed with the sheet dyke rock formations that characterise this part of Cyprus. There’s plenty of shade, some good views to your left and nothing too strenuous by the time you arrive at the first main marker board and resting place at 2 km in (45 minutes). The gradual ascent continues and a further resting place appears after 1 hour 5 minutes: a bench with panoramic views to the north across the Morfou valley and Cape Kormakitis, and towards Patanistasa to the south. There’s more uphill walking to come, now through slightly denser pine forest until a peak is reached just below the nearby summit of Kourtellorotsos at 1266 metres. From here, the walk levels out along the contours and then begins heading back down, at first gradually but with increasing momentum. 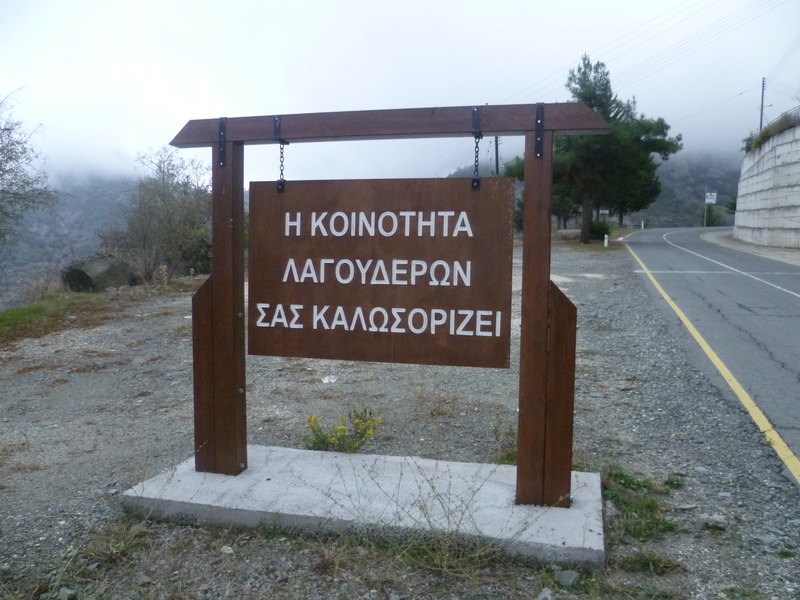 The church of Stavros tou Agiasmati is at approximately 800 metres so there is a descent of some 400 metres to be navigated in around 90 minutes! At around 2 hours 15 minutes the path emerges from the woods and the church can be glimpsed down below in the valley to the right. A further 20 minutes or so of gradual descent and the path ends at the church itself (2 hours 40 minutes). Stavros tou Agiasmati is an ideal spot for a lunch stop. There are picnic tables under shaded trees, a fountain at which to refill water and even toilets. There are beautiful views down across the valley and only birdsong to be heard. The church itself is closed but a sign on the door gives the name of the keyholder in the nearby village of Platanistasa. At this point you may choose to retrace your steps back to Panagia tou Araka. We were, instead, rashly tempted by a CTO map which indicated a “medieval bridge” on a straight E4 walk about two kilometres away. The walk now heads back for a few minutes only, reaching a point where the E4 path diverges (2 hours 45 minutes) from the church route. At this junction, ignore the wooden signboard pointing back towards Panagia tou Araki to the right and instead head upwards along the E4. This a steepish climb along an earth track, marked by occasional E4 markers. 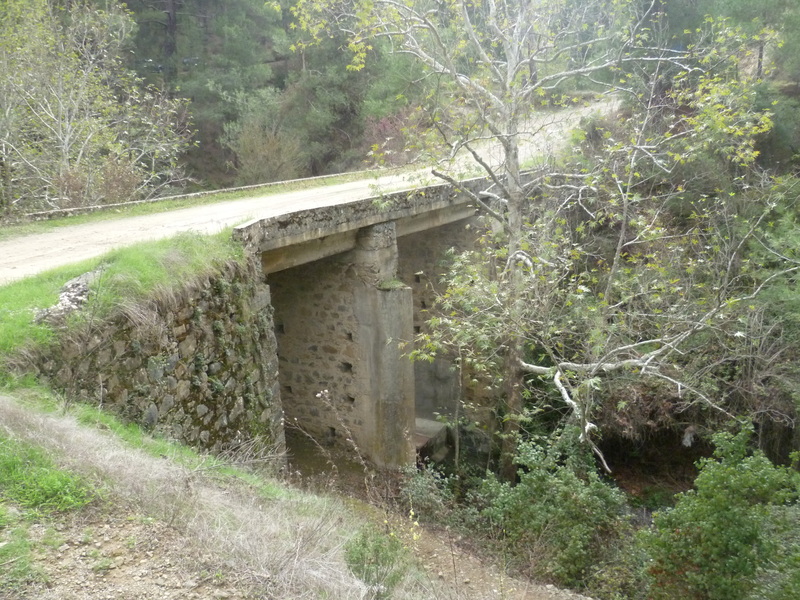 It reaches a peak at around 3 hours 10 minutes and then begins winding back down the other side of the valley, heading towards the “medieval bridge” on the edge of the E907 between Lagoudera and Xyliatos. This is a tranquil walk along a little-used earth track in open forest and with good views across and down into the valley. Occasional signboards point backwards to Stavros tou Agiasmati, increasingly giving the lie to the short straight distance (erroneously) indicated on the CTO map. As the track langourously winds its way down into the valley bed, this turns into a six-kilometre stretch and the bridge is not reached until approximately 4 hours 15 minutes. Nor is there a great deal to see either! There is, it is true, a medieval bridge but it is dwarfed by a large concrete monstrosity built next to it! 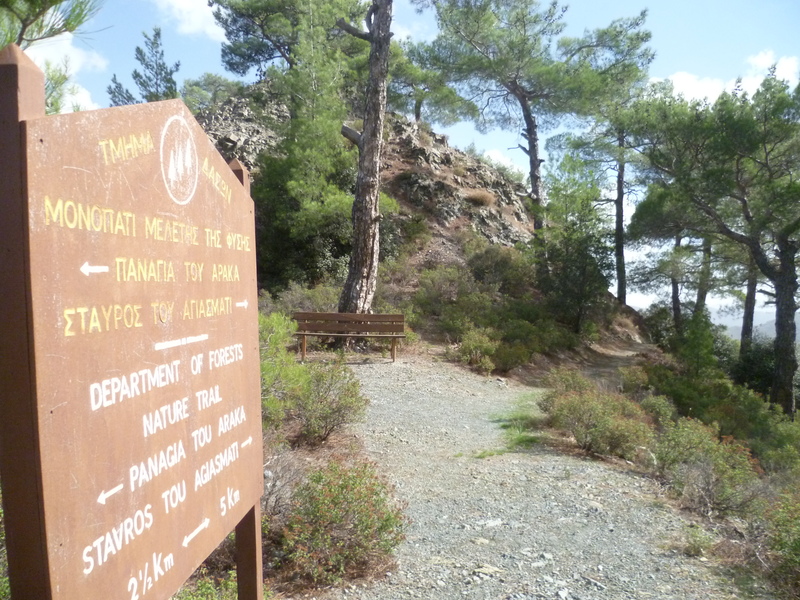 The choice is now a stark one: a six-kilometre hike back up the trail to Stavros tou Agiasmati followed by a further 7.5 kilometre trail to Panagia tou Araka or a seven-kilometre walk along the E907 to Lagoudera. The asphalt road to Lagoudera is quiet (even on the Sunday afternoon during which we walked it) and, in the 80 minutes or so it takes to climb the seven kilometres back up to the original starting point, we were passed by only four vehicles. 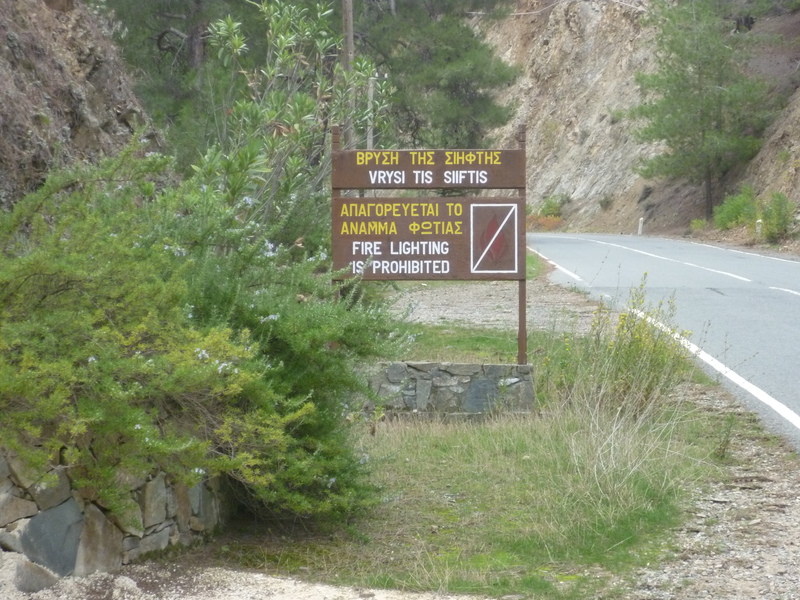 The road winds steeply up from the valley floor, passing Vrysi tis Siftis at 4 hours 25 minutes, which is probably a better place to stop and rest than the medieval bridge itself. From here, on the lower edge of Lagoudera, it is a further 15 minutes of uphill climb back to Panagia tou Araka at approximately 5 hours 40 minutes. By this point the local coffee shop near the church – which had appeared very inviting at the start of the walk – had closed for the day!